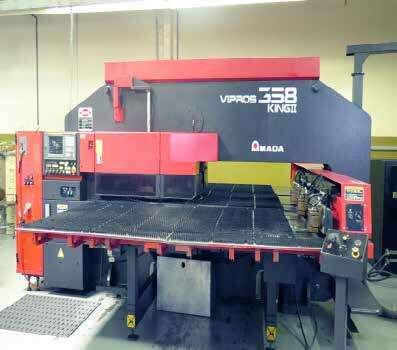 2000 AMADA VIPROS 358 KING II CNC TURRET PUNCH, 58 STATION, FANUC 18P CONTROL, 4 AUTO INDEX, S/N 35840328. 2002 AMADA FBD 1025NT, 98.4’’ X 110 TON HYD PRESS BRAKE, 6 AXIS, QUICK CHANGE HOLDERS, S/N 10253316. AMADA RG-50, 6FT X 55 TON CNC PRESS BRAKE, NC9EX CONTROL, 3 AXIS, FULLY REBUILD IN 2006. 1995 AMADA M-2560, 10FT X .25’’ MECHANICAL POWER SHEAR, SQ ARM, CNC BACK GAGE. 2006 AMADA TOGU III DIE GRINDER, S/N 30230742. AMADA THICK TURRET TOOLING, Z TOOLING WITH COATING, AIR BLOW. AMADA FORMING DIES, HEMING DIE SETS. 2006 HAEGER 824 PLUS, 8 TON, 24’’ THROAT HYD INSERTION PRESS, S/N 8PL10824. TIMESAVER MODEL 137 HDMW, 37’’ WET GRAINER W/ QUICK PANEL CONTROL, FULLY REBUILD IN 2006. 2012 DOOSAN DNM-500 CNC VMC, COOLANT THRU, BT-40, 30 ATC, DUAL CHIP AUGER, FANUC i CONTROL, (XYZ) 40’’ X 21.2’’ X 20’’, 8000 RPM, S/N MV0010-001663. 1997 MORI SEIKI SL-150 CNC LATHE, 6’’ CHUCK, 3J COLLET NOSE, 12 POSITION TURRET, W/FANUC MSC-500 CONTROL, TAIL STOCK, 5000 RPM, S/N 692. 2004 MTA INT V-65E BAR FEEDER, S/N 6199. MIGHTY COMET VMC-750P CNC VMC, 12,000 RPM, BT-40, 20 ATC, MITSUBISHI CONTROL. LINCOLN AC WELER TIG 300. CLAUSING DRILL PRESS, VAR SPEED. ATLAS COPCO GA15 ROTARY AIR COMPRESSOR WITH DRYER AND TANK. 2008 FORD E-150 CARGO VAN, AUTO, V8, 51,000 MILES. TAI LIFT 5000 LB LPG FORKLIFT, 3 STAGE, SIDE SHIFT, 476 HOURS. OFFICE EQUIPMENT, RACKING, SHELVING AND SUPPORT.